There are 2 kinds of people in this world; the kind who have a list, filing system, and storage place for EVERYTHING and the kind who don't. Which one are you? I'm the kind that is 10000% organized in every aspect of her life. And I'm proud of it. So when I started seeing posts about the Emily Ley Simplified Planner system I freaked out!! It seemed very simple but allowed for personalization, which is what I need. I need space to be able to write lists and daily to do tasks, and I need something pretty because it makes me enjoy it that much more. 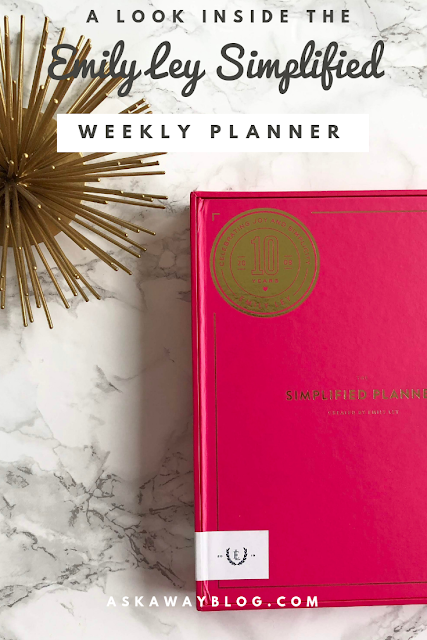 I started looking around for Emily Ley Simplified Planner reviews and once I got a sneak peek of how others love it, I knew I had to have it. Before I start - Emily Ley 2019 planners are selling out fast so head over and purchase one quickly! And one last thing - I was not sponsored in any way for this post. I paid for my organizing supplies and Emily Ley planner myself so this is as real as a review post can get! The planner comes in a beautiful box that you can use as shelf decor for years to come. You can get a variety of designs on your cover and you can choose between daily and weekly planners. I like the weekly planner because it takes up less space in my tote but it also has plenty of room on the weekly pages for me to write down everything I need to do. There are also cute stickers that come in the front in a little pocket that I plan to use to keep some random lists that I don't write on the actual pages. There is also a page for daily tasks and I just happened to have markers that are going to look gorgeous when I fill everything in. There's also a part of the planner that has plenty of lined note pages that surely will last me through the entirety of 2019. This planner is so beautiful! I don't think I'll ever use another brand again! For my worksheets, detailed calendars, scheduled posts, work books, stat trackers, and product info I use a Samsill Duo 2-in-1 Document and File Organizer from Amazon. One side is a binder and the other is an expanding file. I also looked around on Amazon for the perfect pens and markers for planners and found these Paper Mate InkJoy Gel Retractable Pens and these Paper Mate Flare Tip Marker Pens. In my binder I have various workbook and calendar pages I've found on other blogs and I made my own tab dividers for them. In the expanding file I keep documents that I am currently using for research or projects. I carry all of my pens and sticky notes around in a flat plastic storage bag I've had for years. So there you have it! Are you inspired yet to get your STUFF together!??! Tell me in the comments - What do you use to organize your blog, business, and daily life? Sounds and looks like a nice planner.